This is a really interesting little book! This is a history/science book targeted at an advanced middle school reader, but really it’s the perfect book for someone like myself. As a youngster I probably wouldn’t have cared for this book too much. There are a lot of names that don’t roll off the tongue, and a lot of dates, and plenty of science terms that would have been tough for the younger me. The book describes some of the early theories of earth, the sun, and the solar system. From the geocentric views of the earliest philosophers (up through the 1970’s!) to the heliocentric view commonly understood today, this book covers a lot of ground in a very short time. Although on the surface it appears to be a book about the early science of studying the cosmos, there’s a strong, almost anti-religious sentiment here. Of course, in the early days of Copernicus, Kepler, Galileo, and Newton, the Church was the ultimate source for information about the cosmos (also known as ‘the heavens’). The science that most of us understand today was radical theory and opposite of what the Church preached, so it is understandable that a book about the science of the time would reflect a great deal of conflict with church doctrine. But it’s the last chapter that has a weird feel to it. I absolutely love the fact that I learned something in this last chapter (though truthfully, I learned something in all the chapters!) – I’d never heard of the Muggletonians or Cyrus Teed or Wilbur Glenn Voliva and, well, if I hadn’t heard of any of them I wouldn’t be any worse off. I understand that there’s an interesting point here that science and religion are often still at odds despite the more accepted Church having come to a better understanding and acceptance of science … but what do these more recent religious fringe elements have to do with ‘recentering the universe’? It feels more like trying to poke fun at all religions by picking out a few of the more extreme fringe elements. I would have much rather seen a chapter on some of the more modern scientists (Carl Sagan? Stephen Hawking? Neil deGrasse Tyson?) than give any kind of credence to the crackpots. Otherwise, a worthy book for students. Looking for a good book? 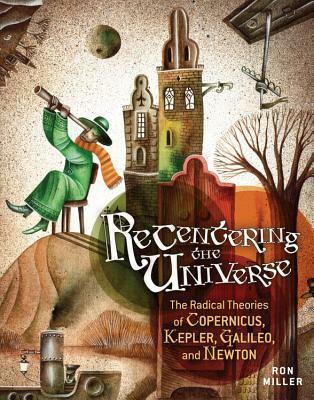 Recentering the Universe by Ron Miller is a wonderful abbreviated history of the struggle between science and religion when discoveries about the solar system were being made, but the book takes a tangent near the end that takes away from the value of the rest of the book.